The Singing Brothers is a signature image from Neal Urban. He based the idea from a painting called The Singing Butler by Jack Vettriano. Neal has always admired his paintings. He knew Tom had two brothers. He had already did family portraits for one of them, so he knew the brothers were very close. Neal showed me the Singing Butler image a few days before the wedding and said he wanted to do something like this, but with the groom's brothers. I loved it! He had a few different ideas, but wasn't sure. He was watching the weather the night before and they were calling for rain. That is when he got this amazing idea! Let's have his brothers hold umbrellas and have Kelly and Tom dance! The reception was at the Statler, so he wanted to do this right across the street at Niagara Square. Before we took the bride, groom and best men out, we told them the idea. They could not wait. Neal and I already had the lighting ready to go, so we we could get everyone back back inside to the party! It was the best party of the season! We got everyone in position, with all the street lights in the back. We also had the Statler in the back ground as well. 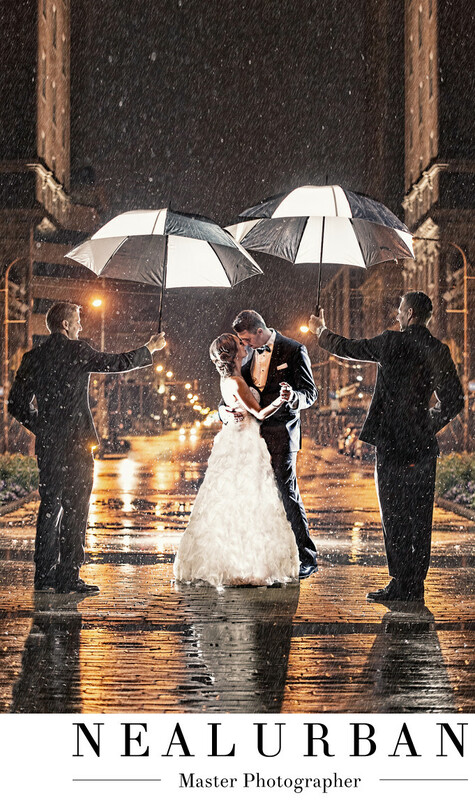 Both brothers held lights to help light up the newlyweds and under the umbrellas. I was holding another to light up their faces. Then we asked Kelly and Tom to start dancing. All of a sudden you heard the brothers singing. When we listened closer it was the Thong Song. It was so funny. The bride and groom could not stop laughing. All Neal needed was one shot without laughing. We got so many out takes and fun images in this series. He did get his artistic image. He entered it in the WPPI(Wedding Portrait and Photographers International Print Competition) in Las Vegas. It scored very high! Neal knew going into this shot, he wanted to submit it! This image is amazing and is such as personal story to the couple. We do not like to take images just to take them. If someone asked for the same image, we couldn't do it. We would come up with something that meant something specific to the client. All images come with a story!